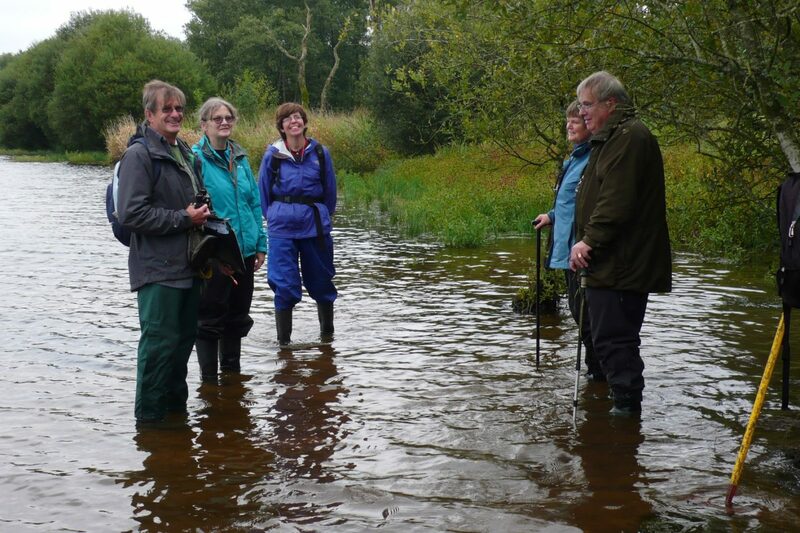 Eight of the Dumfriesshire Botany Group met at Castle Loch, Lochmaben on Sunday 2 September. Contrary to the forecast it was rather cloudy and there was drizzle for much of the day. We parked by the remains of the old Castle on a promontory of the Loch and as we were within the square were able to start recording straight away. The remains of the castle, which is where Robert the Bruce is reputed to have been born, are pretty fragile and fenced off as parts have fallen off in recent years. The vegetation on old walls can be interesting but the castle was largely disappointing in this respect despite a good search we were only able to find Maidenhair Spleenwort, Asplenium trichomanes ssp. quadrivalens as a wall specialist and Dove’s-foot Crane’s-bill Geranium molle and Mouse-ear Hawkweed Pilosella officinarum as a colonist of lower stonework. There are some very impressive trees around the castle. A large Hornbeam Carpinus betulus had good seed clusters. Under the trees Drew showed us the leaves of Sweet Violet Viola odorata he had seen previously. We couldn’t decide the variety though as that depends on flower colour. Castle Loch is a Site of Special Scientific Interest (SSSI) and a Special Protection Area (SPA)/RAMSAR site for the winter bird roosts but it also has notable plant communities including some less common species. The Loch is over 100ha and has a narrow reedswamp backed by natural woodland of willow, birch and alder along most of the shore. The loch levels were high and so there was no summer drawdown zone. This made it almost impossible to reach the edge of the reedswamp dominated by Common Reed Phagmites australis and Reed Sweet-grass Glyceria maxima except in a few small bays. Here we found some aquatics. There was lots of Nuttall’s Waterweed Elodea nuttallii, with narrower leaves than Canadian Waterweed Elodea canandensis, (which we somehow missed). There was also a lot of Rigid Hornwort Ceratophyllum demersum. This looks like a Water-milfoil Myriophyllum sp. with reduced leaves in whorls but the leaves have teeth. It is uncommon in west Scotland and was first recorded in Dumfriesshire only in 1968 at the Kirk Loch. It may befit from nutrient enrichment. The Ivy-leaved Duckweed Lemna trisulca was also present. 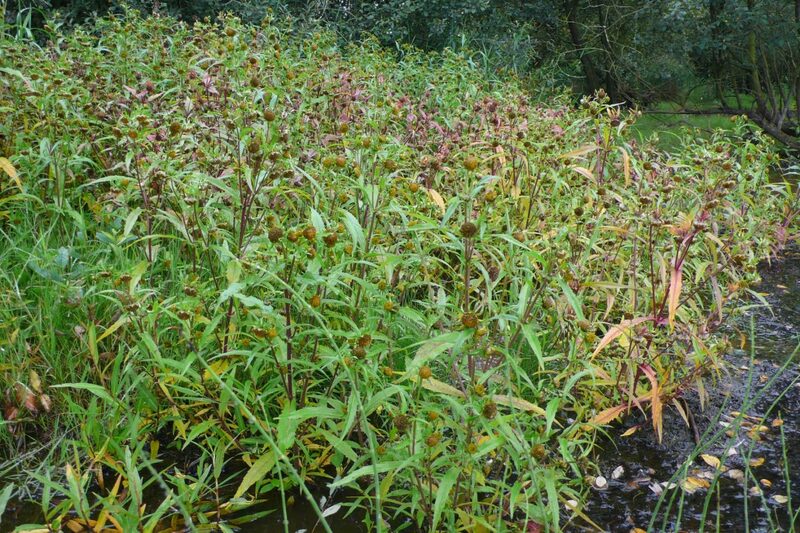 In the reedswamp we saw Cowbane Cicuta virosa and Lesser Bulrush Typha angustifolia with markedly narrower leaves than Bulrush Typha latifolia, and Zoe found some Skullcap Scutellaria galericulata. An interesting willow found on this shore turned out to be Almond Willow Salix triandra var. hoffmaniana with small leaves with toothed margins and ovate auricles. This is a first record for Dumfriesshire. We had lunch back at the cars to keep as dry as possible before exploring the next square on the more open south side of the loch. Drew was able to take us to a location on the shore where Bur-marigold was growing. Before we got there we fished out a nice narrow-leaved pondweed from the Valison Burn, the outflow from the loch. This was Blunt-leaved Pondweed, Potamogeton obtusifolius. The careful walk to the shore avoided ditches and led to a wonderful patch where the two native species of Bur-marigolds were growing together on a shallow sandy shore. Trifid Bur-marigold Bidens tripartita was holding its flowers upright and had lower leaves with a winged petiole and leaves deeply divided. Nodding Bur-marigold Bidens cernua had drooping flowers and undivided sessile leaves. 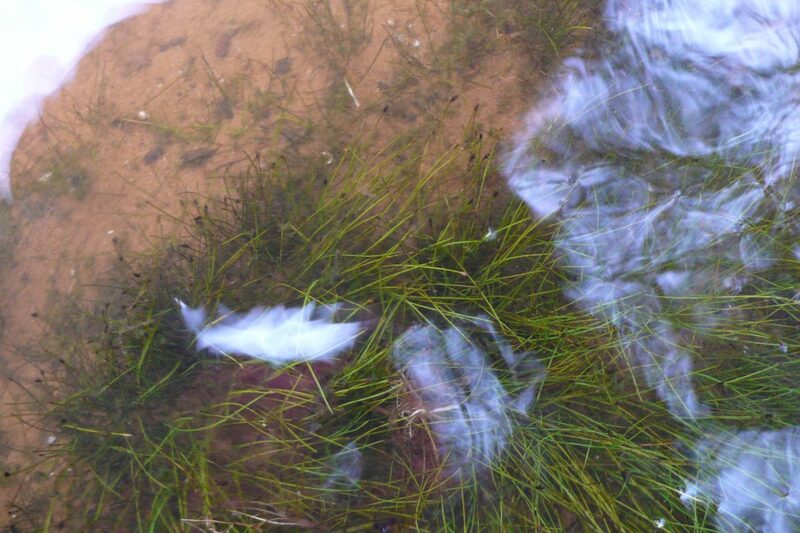 Just beyond them in the shallow water were patches of Needle Spike-rush Eleocharis acicularis forming grass like swards. This has been known from the Lochmaben area since 1831. It has not been found anywhere else in the county. Also on this loch shore was Celery-leaved Buttercup Ranunculus sceleratus, and Water-plantain Alisma plantago-aquatica. As we headed back across the rushy pasture Drew showed us the patches of herb rich grassland with Whorled Caraway Carum verticillatum. The Lochmaben population is currently the most easterly known of this species in Southern Scotland, and is isolated from others in western Dumfries and Kirkcudbrightshire where it becomes very common.